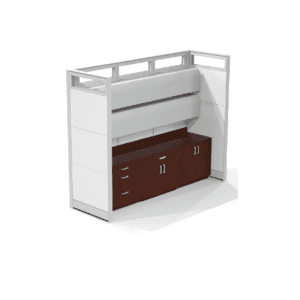 We are happy to introduce Skutchi Designs – a smart source for stylish demountable wall systems and modular offices. Their owners have over 25 years’ experience in the office furnishings industry. They work with Fortune 500 companies, schools, hospitals, libraries and government, so they know how to design an impressive office that meets budget. In addition to carrying their own line of architectural wall systems, they have a proprietary line of office furnishings. Everything is customizable. And because their systems are so flexible, they can be adapted to any space to improve the way you work. If outdated carpeted cubicles aren’t cutting it anymore, Skutchi has a few tips that will improve your office design – and function – now and into the future. Tip #1: One Size Fits All, Doesn’t. What you need is flexibility. An architectural system should be adaptable to your specific needs. Mapping out your office space may seem like an easy task, until you realize not everyone works the same way, has the same space requirements, or privacy needs. There are spaces in nearly every office that are challenging to use. Maybe there are no walls where a private office could be, or your reception area is larger than necessary. That excess space could definitely be put to better use. Chances are, any challenge you’re facing now, a furniture designer has faced before, and solved with style. In one case, we had a client whose layout of gray, fabric-wrapped office cubicles created a one-dimensional ‘dead-zone’ along the walls. Our demountable wall system, featuring architectural walls with storage, provided the right fix. It added dimension to the space without interfering with foot traffic. And the storage cabinets are extremely functional, durable and modern. Imagine you had the ability to add and remove walls at will – without worrying about costly, messy construction. Demountable walls let you change your office to accommodate new ways of working. That means you can make the most of your space right now, while you search for a new location. Or endlessly transform the space you’re in. and so much more, to create the right office size and shape. Demountable wall systems create a professional, modern office that changes with your business. Those ancient, unappealing cubicles have got to go. While professional office movers can take care of that part for you, your business is still growing and will likely relocate or expand, making a demountable wall system the smart choice. Walls can be dismounted, relocated, and installed in a new location with ease. So if you decide to rearrange your office space, you’ll have no problem reinstalling the system yourself. There’s no better way to demonstrate success than with an entirely new office space. So make the most of your opportunity.